Left: A Face Without A Name; Right: A Love! One of my “Faces Without A Name”! The photo on the left was among the possessions of my maternal grandmother; unfortunately no names are written on the back! The photo was taken by William Anderson of 364 Hamilton Place, Glasgow; it seems at one point in time he was also located at 364 Dumbarton Road, Glasgow. He was in business during the late 1800’s and early 1900’s. The gentleman on the right is my maternal great grandfather. The picture of this couple is one of many “unknown” photos in my possession; “Faces Without A Name”! I see a family resemblance…. Do You? 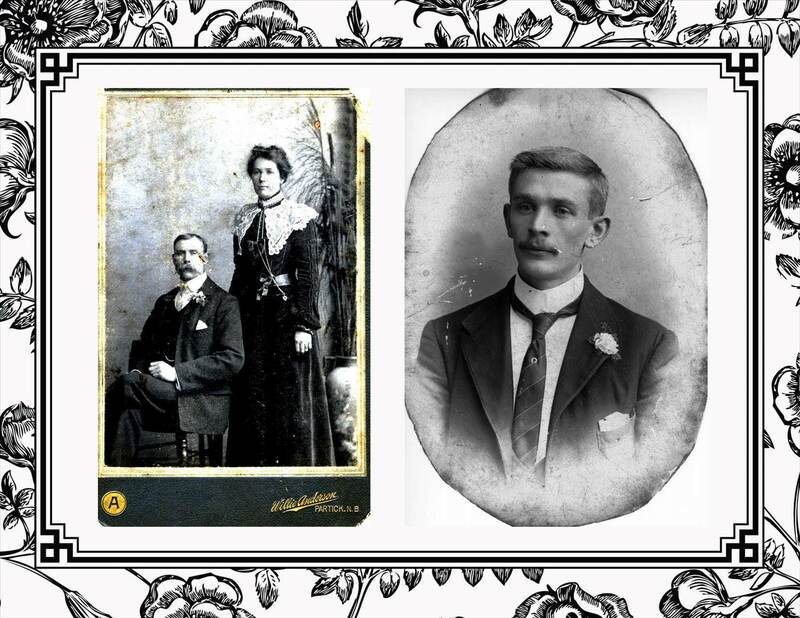 This entry was posted in Co. Londonderry, Family History, Geneaology, Ireland and tagged "Faces Without A Name", Co. Londonderry, Family History, GeneaBlogger Daily Blogging Prompt, Genealogy, Glasgow, Ireland, Love Family, Scotland. Bookmark the permalink. 15 Responses to Mystery Monday! Great photo’s, I just love old pics, don’t you…shame when there are no names tho….. It absolutely is a shame! I have so many beautiful photos and KNOW they are family; unfortunately just not their names! 😦 Thanks for reading! Yes and the problem is I guess we will never know!!! As time goes by there is less and less chance that anyone will be around who remembers, then again…maybe when you visit Ireland soon, someone may also have photo’s that might just match, or be the same people and you never know what you might discover!!!!! I’m truly hoping for that! If I can discover who today’s “unknown photo” is, it will tell me who many others are in my collection! Story was that my maternal great grandfather had a twin brother; one whom he didn’t know about until he was “man big”! I think this is his twin… nothing other than gut instinct! 🙂 I can’t even find a birth record for the mystery “twin”! Well I have never heard of that one here in Australia, but we do have “Canadian Club” have you heard of that?? haven’t had it for awhile but so yummy, I love it with Dry Ginger, I don’t know if it is a Canadian Scotch but mmmmmmm, bit of a worry really as it is only 6.30 am here, why am I even thinking of drinking scotch….lol, truly I hardly ever drink!!!! lol, that’s us Aussie’s we all think it is a pretty good drop….lol that is so funny, yes will have to check out if Crown Royal is on the market here….I can’t stop laughing, I love CC…. Thank you and thanks for reading! 😉 I have taken a peek at your blog too; love your photography! Thank you! Wish you luck with your research! I know for the photos I find, I have started a Family History Event on my Facebook and have all my family members part of it, including some aunt and uncles in the 80’s. I post the photo and do like you did, tell everything I know and ask if anyone could tell me more about who is in the photos. I gotten lucky a few times. I too love old photos and find myself buying them are second hand stores even though I do not feel they are related. I just like to hunt to see if I can figure out as much from the photos as I can. Best of luck with your photos and family research. Hi Karen, thanks for reading my little blog. It still surprises me when someone new reads it, as I am just doing this for me! 😀 The frustrating thing is …. I KNOW this couple are my family; I have many pictures of them along with their children; I just haven’t been able to name them YET! There is a distinct possibility that he is my great grandfathers twin brother; whom he learned about when he was “man big” (as the family says). I would love to find out more about him. It’s so frustrating; but as we know, it’s also part of the excitement. My daughter just got home from teaching her fencing class; so, my “dead people” will have to wait until a little later! Take care.